Sam has worked many faucets in the veterinary clinic in the past 5 1/2 years, starting from a kennel attendant, to a technician assistant and finally to currently being a CVT. 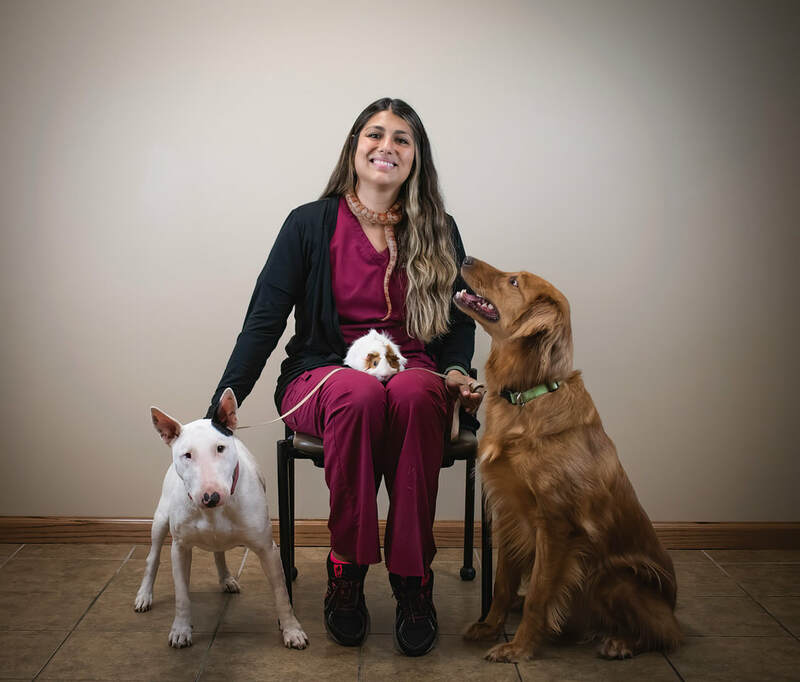 She spent 4 1/2 years working at Eau Claire Animal Hospital, left for one year to work at an emergency clinic only to return to the clinic that always felt like home, ECAH. Sam's greatest joy about working in this field is caring for the wide variety of animals and their owners that trust in our hospital. She enjoys working in veterinary medicine because it is always changing and she gets the opportunity to continuously learn to better the care for her patients. When Sam is not at ECAH she enjoys spending time with her husband, Josh, doing anything outdoors and taking adorable pictures of their 1 year old rescue dog, Ellie. During the warmer months, Megan enjoys spending free time with friends and family. She can be found camping and fishing or simply taking a stroll with her dachshund, Sadie. Julie grew up in Afton, MN. She graduated from Globe University in Woodbury, MN, in 2016, with an associates degree in Veterinary Technology. She currently lives in Strum, WI where she bought a house. Julie enjoys spending time with family, friends, and her Dachshund, Lucy. ​Alicia started her adventure at ECAH as an intern. Once she graduated from Globe University, in June of 2016, she was hired on as a receptionist and Certified Veterinary Technician. She loves caring for and working with all the special and unique animals that come into the clinic. When Alicia is not at work, she is enjoying life as a mother to her son, Christina and daughter, Victoria. ​Katlin graduated from Globe University-Eau Claire in December 2016. She currently lives in Mondovi, Wi with her fiance Jacob, daughter Alayna, and 4 pets. Rocky is a lab mix and three cats Everest, Cascade, and Denali. Katlin loves that she can put her passion for animals into a career as a technician. In her free time she enjoys being outdoors, hunting, fishing, and hanging out with friends. Animals are pretty much Sarah's life. She has four adopted pets, a Bull-Pug Charlie, cats Al & Mo and a rat Slim Shady. If she's not spending time with them or at work she is usually cooking or taking photographs. Sarah treats every animal as her own and couldn't imagine life without a pet! with her German Shepherd mix, Olive.